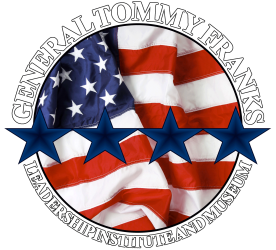 The General Tommy Franks Leadership Institute and Museum is dedicated to the preservation of history and the development of leaders. Over the past year, GTFLIM has invested in the lives of thousands. When you sign up for a Tour of Duty you are investing in the development of our next generation of leaders. Your gift of just $25 per month will provide programming for 100 students, $50 per month will provide a new educational interactive kiosk, $100 per month will provide for a regional leadership training workshop and $250 per month will provide for the development of a new display which will enable GTFLIM to more effectively communicate history and leadership principles. EVERY gift is a significant investment in the lives of others! Take the challenge. Sign up today.